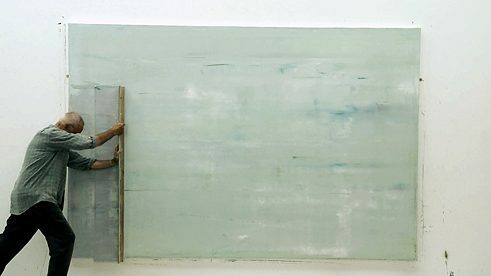 The multi-part Strip Paintings series started with a segment cleaved from one of Richter’s 1990 paintings. Measuring a mere pixel in width in its digitised form, it was duplicated to fashion lines and patterns; then, with other snippets, the process was repeated to create other works. Staring at one of the finished pieces proves instantly and deeply mesmerising, with the stripes often inspiring optical effects. Demonstrating art at its most immersive, their transfixing sights implore the viewer to stand in place, keep gazing and enjoy the unexpected sensation in front of them. In welcoming art lovers into GOMA’s extensive retrospective — Richter’s first major Australian exhibition — Strip (927-9) makes a firm opening statement. From that point onwards, succumbing to the vivid, thorough and revelatory showcase is inescapable. Though much of his art is inspired by reality, whether recreating photographs while ensuring the texture from their original state is apparent, painting portraits of his family members that remain far removed from standard images, offering a gallery of his own snaps spanning decades or depicting the horror of real-life tragedies in various ways, the cumulative effect borders on dream-like. Richter captures life around him in a manner that makes his pieces seem much more than just a mirror of the world; to look upon them is to get caught in their reflective thrall. Indeed, there’s a transformative feeling that seeps from Richter’s output. To help attendees understand how that sensation comes about, GOMA is screening two Richter-focused documentaries alongside the exhibition, delving further into the artist’s work — and often, in his own words. The first, Gerhard Richter — Painting, serves up the kind of insights that every art lover dreams of: glimpsing the man himself making his pieces, stepping inside his studio, and exploring the relationship between his art and the reality he seeks to examine. Directed by Corinna Belz (Peter Handke: Bin im Wald. Kann sein, dass ich mich verspäte…), the film finds a way to balance the difficult tussle that sits at the centre of art-focused documentaries: the desire to hear more about creative works and their creators, and the inescapable truth that all of the conversation in the world can’t always do either justice. Accordingly, it spends time in conventional territory, compiling archival footage and interviews, but it is at its best when it’s taking one of his beliefs to heart. “To talk about painting is not only difficult but perhaps pointless, too,” Richter explains. “You can only express in words what words are capable of expressing, what language can communicate. Painting has nothing to do with that,” he continues. 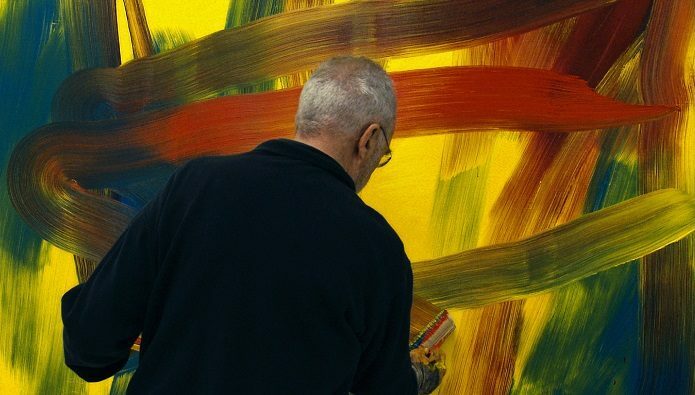 In response, when Gerhard Richter — Painting depicts just that — that is, Richter painting — it turns observing a master at work into a portrait of what makes his work masterful. While watching Richter in action proves illuminating, and discussing his life as he works as well, Gerhard Richter — Painting also makes plain the discomfort he feels at being under scrutiny. Though his pieces are crafted to be seen, he eventually protests the camera’s presence during their creation; “I don’t think I can do this painting under observation,” he notes. The same sentiment is evident in the second title in GOMA’s program, Gerhard Richter: 4 Decades. Here, he walks around New York’s Museum of Modern Art in advance of his first major United States retrospective in 2002, chatting with curator Robert Storr. His thoughts on his output remain revealing; however his wish not to talk them through is clear as well. Gerhard Richter | © Gerhard Richter: 4 Decades Featuring the central duo and Richter’s translator stopping and discussing a selection of the 188 pieces on display, the documentary is a straightforward walk, talk and peer-type film by Michael Blackwood (The Juilliard String Quartet: Keeping Beethoven Contemporary). Gerhard Richter: 4 Decades’ standard construction mightn’t lure audiences in, but Richter’s musings still will. Chief among them arises from his contemplation of his nature-focused efforts; “there is a desire to actually be in those places — that transports you,” he offers. It’s a simple statement, and yet it’s one that speaks to his intentions as much as the effect experienced by those who stand before his works, as well as to his reluctance to say more than he has to. When someone makes transporting pieces of art, capturing and then conveying that sensation is the entire point.